Friday, 12th October, the show took place in Pullman, Docks de Paris in France. Mr. Numnoi and his Singpatong Team together with Lumpinee boxing stadium referee and judges made a new experience of muay thai at Prestige Fight in Paris. It’s a great opportunity to work with Mr. Djamel Yacouben (the promoter and organizer of the evening), Mr. Daniel Allouche (speaker), Hadj Betahar (WBC Europe), and Thai promoters with this exceptional event in Paris. Expanding the reputation of muay thai culture around the world contributes to the development of the practice of this sports activity. 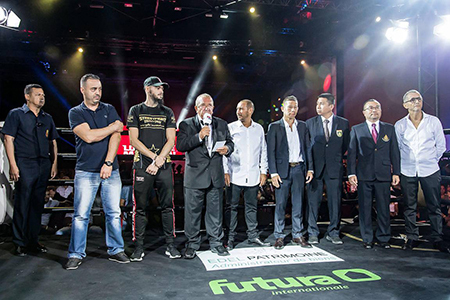 All in all, It was a successful event with the best lumpinee champions, French and Thai boxers performed a great show of the evening. 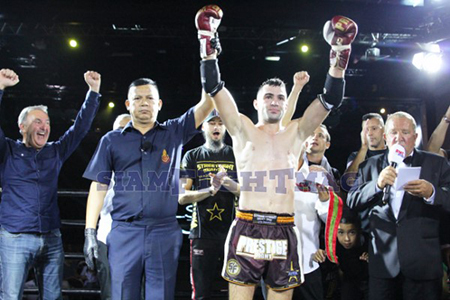 Rafi Bohic Singpatong faced a Thai fighter Tanachai Rachanon in All-Star Muay Thai organized by Prestige Fight. Tanachai is a former Champion of Thailand, Omnoi Stadium Champion, WMC World Champion, and Champion of the World Phoenix. Tanachai coached by The Great Thai Lamkong Champion. French fighter hardened his fist and worked his low kicks in the second round. Rafi is determined to place his dreadful kicks to his opponent as he keeps moving forward to Tanachai. Rafi immediately perceived the weak points of Tanachai, his back leg. Tanachai can’t keep away Rafi’s powerful lower kicks. Rafi gave his best on the third round, and the Thai boxer collapsed in pain.